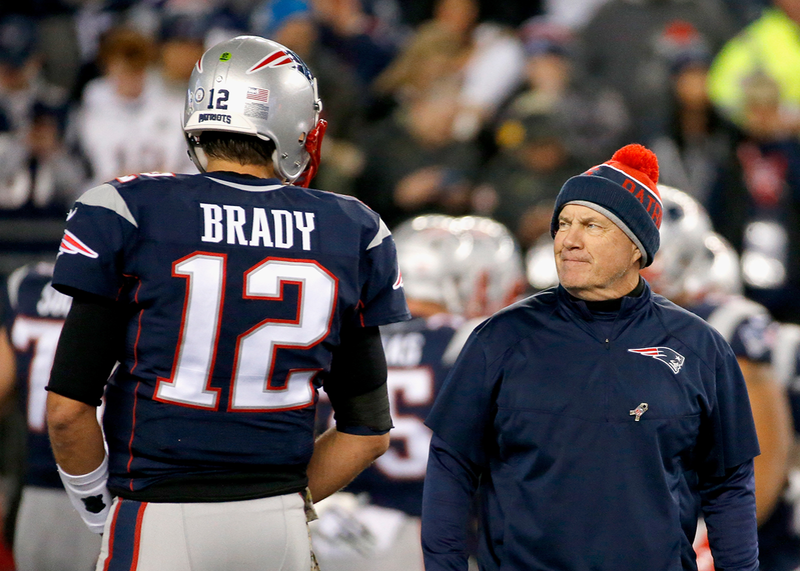 Is it morally acceptable to root for the New England Patriots in the Super Bowl? A guide for morally compromised New England fans. Patriots head coach Bill Belichick talks with Tom Brady before a game against the Seattle Seahawks at Gillette Stadium on Nov. 13 in Foxboro, Massachusetts. It gets harder and harder every time. By virtue of having grown up in the greater Boston area, I am a fan of the New England Patriots, perhaps the most successful and most widely loathed sports franchise of the 21st century. For much of my childhood and young adulthood in the 1980s and 1990s, this was a laughable identity—the Patriots mostly vacillated between mediocre and terrible, their two pre-millennial Super Bowl appearances resulting in blowout defeats. This all changed in 2002, when the Pats, under second-year head coach Bill Belichick and first-year starting quarterback Tom Brady, beat the seemingly unbeatable St. Louis Rams in Super Bowl XXXVI, one of the biggest upsets in NFL history. They won two more titles in 2004 and 2005, improbably establishing themselves as the gold standard of the league, and their coach and QB as gridiron geniuses. In the years since, the Patriots have appeared in three more Super Bowls (four come Sunday) and won one more title in 2015, all while relentlessly building a reputation as the league’s foremost heels, a franchise whose devotion to winning has led it to cheating scandals both real and inflated. Maybe Brady and Belichick didn’t actually vote for Trump. Look, I saw the #MAGA hat in Brady’s locker just like everyone else and have followed his mealy-mouthed nondenials of support for his thick orange friend. I’m not confident that Brady voted for Hillary Clinton; he grew up in a devout Catholic household with a father who attended seminary for seven years, he attended one of George W. Bush’s State of the Union addresses, and he curiously skipped a 2015 White House visit in order to shop for an Apple Watch. I’m just not sure he voted for Trump, either. Tom Brady is a world-class weirdo who seems focused on three things: his family, his own body, and his football team, in disturbingly ambiguous order. Read this Mark Leibovich profile of Brady from two years ago and tell me if this sounds like a guy who votes. And even if Brady did vote for Trump, good lord, if I watched sports because I supported the political views of the players, I probably wouldn’t watch sports. As for Belichick, it’s long been rumored that he’s a Democrat, and I’m resistant to the idea that there’s a single Wesleyan grad in America who pulled the lever for Trump, even one as illustriously dyspeptic as Belichick. It also just doesn’t fit his personality: Belichick is detail-obsessed, myopically focused, pathologically spotlight-averse. None of this screams affinity with our current resident of the White House. So whither the letter? Days before the election Trump read aloud a letter of “support” from Belichick (which stopped short of endorsing his candidacy) at a campaign rally in New Hampshire. My working theory is that Belichick was prodded into his pro-Trump statement by Pats owner Robert Kraft, one of Trump’s most prominent friends in the sports community. If true this is horrific, but pro sports owners are a horrific bunch, and even if Kraft voted for Trump (he, too, has been close-lipped on the matter, and has a history of supporting candidates from both sides of the aisle), he at least hasn’t been tapped for a post in his administration, as Todd Ricketts (Chicago Cubs), Betsy DeVos (Orlando Magic), and Woody Johnson (New York Jets) have. Trump may love the Patriots, but the vast majority of Trump supporters will be rooting for the Falcons on Sunday. Fine, in fairness, the vast majority of Hillary Clinton supporters will be rooting for the Falcons on Sunday, too—hating the Patriots is perhaps the last truly bipartisan pastime in America. But the average Trump supporter, with his hatred of coastal elites and preoccupation with law and order, likely despises the Patriots with particular intensity, for their extremely coastal and extremely elite (again—Wesleyan) and distinctly cheater-ly approach to their sport. What’s more, it’s a taken-for-granted truism that the only people in America who root for the Patriots are residents of the six New England states, where Trump was soundly defeated. In Massachusetts, Clinton beat Trump by a whopping 27 percentage points. So not only is there a high probability that the typical Trump supporter hates the Patriots, there are an awful lot of Patriots supporters who hate Trump, too. Even if we take Belichick’s letter and Brady’s stupid hat as “endorsements” there’s no evidence that they moved the electoral needle for Trump. There’s also a decent chance a lot of the Patriots themselves hate Trump: Earlier this week the team’s tight end, Martellus Bennett, one of the NFL’s most interesting and magnetic humans, announced that he’d likely decline a White House invitation were the Patriots to win a Super Bowl. The league that Goodell represents is a cesspool for corporate oligarchy and the patriotism of scoundrels. It treats human bodies as disposable and has the worst labor conditions of any major professional sport, despite being the most lucrative. Earlier this season, when 49ers quarterback Colin Kaepernick made the decision to simply not stand for the national anthem as a protest against racial injustice and police brutality, hordes of fans organized a “#BoycottNFL” movement under the asinine logic that Kaepernick’s protest was disrespectful to the U.S. military (incidentally, one of the NFL’s corporate partners). Then-nominee Donald Trump suggested Kaepernick leave the country. When the NFL’s ratings dropped, Goodell issued a cursory defense of Kaepernick’s right to free expression that the commish carefully drowned out in dog whistles, including this incredible passage: “I support our players when they want to see change in society, and we don’t live in a perfect society. We live in an imperfect society. On the other hand, we believe very strongly in patriotism in the NFL. I personally believe very strongly in that.” Whatever “patriotism” is extolled in this passage is pretty disgusting. Goodell and the Patriots despise each other, as the yearslong cycle of suspensions, challenges, appeals, and resuspensions has driven home. (Brady missed the first four games of this season as punishment for Deflategate, nearly two full years after the alleged malfeasance had occurred.) Goodell hasn’t attended a game at Gillette Stadium since before the controversy, a startling absence considering the Patriots are, ends-wise if not means-wise, his league’s banner franchise. As ESPN’s Don Van Natta Jr. and Seth Wickersham reported back in 2015, from the start Deflategate was taken up by Goodell and his billionaire bosses as a clunky vehicle for a quixotic revenge quest for the commissioner’s own bungling of the Patriots’ “Spygate” misdeeds of 2007. To watch Goodell forced to share a podium with Belichick and Brady this Sunday, handing over a fifth Lombardi Trophy that would solidify the 21st-century Pats as the greatest sustained dynasty the NFL has ever seen, would be like watching Trump in a weight-lifting competition with Arnold Schwarzenegger—you might not be actually rooting for either, but you’re sure savoring the certain embarrassment of one of the parties. I’ve often said that rooting for the Patriots feels like rooting for the Joker in a Christopher Nolan Batman film—they’re psychotically single-minded, amoral, gallingly narcissistic, purveyors of opportunistic, meticulous chaos. But what if the Joker is right? What if Gotham is irredeemable and Batman is even worse? I’m just about done with the NFL and everything it stands for, and an increasingly large part of me hopes I’m too good to ever watch another professional football game after this one. But I’m not too good to want to go out on top.